"No air arm of any kind was permitted (article 198) and all stocks of air material not already handed over to the allied authorities were to be destroyed (article 201). Even civilian was to be restricted "During the six months following the date on which the present treaty comes into force, the manufacture and importation of aircraft, parts of aircraft, engines for aircraft and parts of engines for aircraft shall be forbidden in all German territory (article 201)". The book shows that in practice, due to the tumultuous state of Germany at the time, that many airplanes and parts escaped the Allies. These wound up in private hands, or the Freikorps (small private right wing and nationalist armies engendered to fight Communism, and try to take back some of Germany's eastern border). The book comes with fifty-six full pages of black and white photographs. The Author goes into the Treaty of Rapallo. This treaty on the outside was to normalize relations between the German Weimar Republic and the Soviet Union. Secret clauses of the treaty stated that Germany could use bases in the Soviet Union to develop military aviation, among others, in secret and away from the prying eyes of the western powers. The book also shows how from day one Hitler wanted to not only rebuild German military aviation, but also wanted the Luftwaffe as strong as it could be. This was to deter the western powers from interfering with Germany due to the treaty of Versailles clauses. The author puts in many tidbits of history to flesh out the story. One example is Erhard Milch, later a Field Marshal, in charge of production for the Luftwaffe. To get around the fact that his father was Jewish, Milch had a signed paper from his mother stating that he was actually the product of an incestuous relationship with her brother! Many such historical pieces are seen in the book. This is only Volume I of three and I eagerly look forward to reading the others in the series. 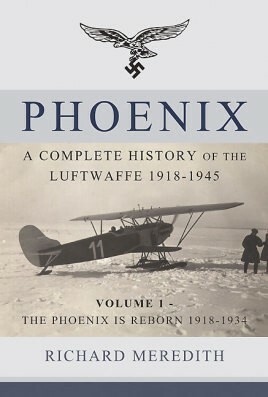 I can easily recommend this book to anyone interested in the early and pre-history of the Luftwaffe.